The catch – she must go undercover in a vampire-controlled town where an assassin is on the loose and everyone is a suspect, including herself. Worse, she must ignore her growing attraction to vampire Henry Bautista. 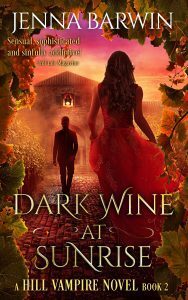 He’s rich, dangerous, and as complex as the wines he makes, and he will do anything to stop her from hurting the community he built. CLICK HERE to escape into the mystery, romance, and political intrigue of the Hill Vampire vineyards. Dangerous and seductive, the suspense will grab you and not let go. 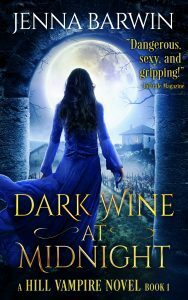 Want to know when book 3 of the Hill Vampire series, Dark Wine at Dusk, goes on sale? Sign up for Jenna Barwin’s newsletter by clicking here.